This club has been a source of guidance and inspiration to the youth of Galway, especially those of working class background, since its foundation by Fr Leonard Shiel SJ, a priest of great vision, in 1940. Indeed this wonderful structure owes a great debt to the Jesuit Order. Since the beginning the club has been based behind the Columban Hall in Sea Road. From the first nervous day of membership, right through their teens, and even in adult life, the spirit and ever watchful eye of the club is with the boys. The need for such a club, especially in the early years, was enormous, as there was little or no recreation available to the youth of Shantalla, Bohermore, The Claddagh, and ‘The West’. Here at last, they could get together in the spirit of fellowship and enjoy whatever games and competitions the committee could organise for them, and all for a nightly fee of one penny if they could pay. Teams were formed and indoor games, supervised by the committee, were organised. Each team played two games per night and points were awarded. As the club was advancing, competition games changed from darts, rings, and draughts to volleyball, basketball, groundball, and skittles, and towards the end of the season, the tension could become almost unbearable. In addition, they could play table tennis, billiards, and snooker. After the games, prayers were said and boys were instructed on how to behave in company or at home, how to treat their girlfriends and, later on, how to prepare for marriage. The evening would end with a mug of tea and a thick slice of bread and jam, often an important supplement to their diet. The soccer section was started up by Eddie Fahy and Mickey Sullivan. They produced many great players, two of whom, Paddy Power and Miko Nolan, were awarded Irish caps. Fr Ó Brolcháin SJ introduced Irish dancing and this was carried on by Peter Joyce. Amby Roche and Mick Lohan set up a boxing section. Swimming and lifesaving was introduced by Fr Ó Brolcháin and Father Michael McGrath SJ set up the rugby section. ‘Fr Michael’, as he was known, arrived at the club in 1949 and lost his heart to the cause. He organised an annual retreat for the boys. For those who stepped out of line, the club was always ready to intercede with the authorities and had many successes in terms of sparing boys a criminal record. For those few who did go to jail, they often organised visits and followed their cases to the last. 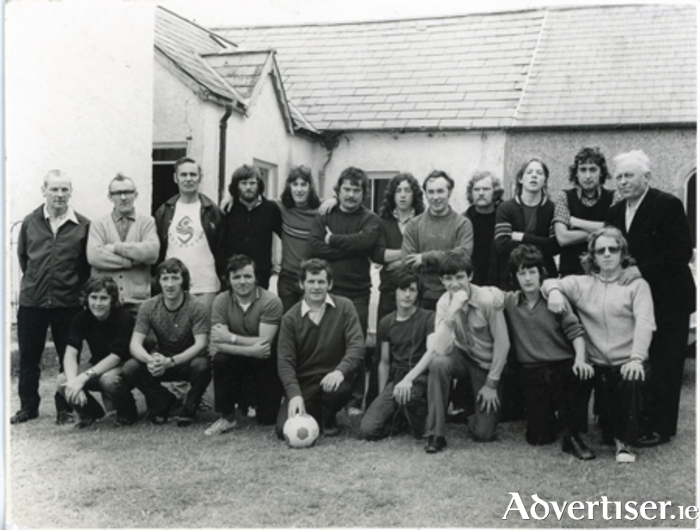 Our photograph was taken in 1964 at the annual camp in Clifden and shows, front row; left to right: Des Folan, Michael Grealish, Paddy McDonagh, Jim Cunningham, Martin Burke, Michael Kelly, Tony Burke, Martin O’Neill. Back row: Des Kenny, Tommy Kelly, Noel Ó Beara (Irish Water Safety Association ), Gerry Traynor, Joe Walsh, Des Kenny, Gerry Curran, Brother Hugh Monaghan SJ, Jimmy Lawless, Michael Walsh, John Seery, and Fr Michael McGrath SJ.